It was my lucky day: I’d just received an invitation to attend a very special wine event to taste a wine that even money can’t buy! The “Kreuz–Neroberger” Riesling is a wine made entirely from grapes sourced from Berlin’s oldest vineyard in Kreuzberg. 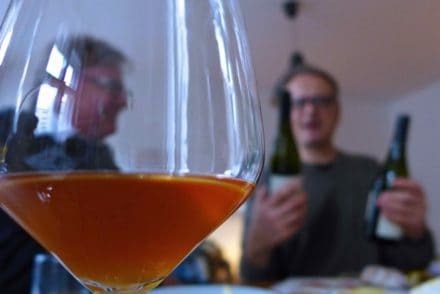 A friend forwarded me a link to a podcast from NPR News Berlin, featuring a story called “Watch out, Bordeaux – here come the wines of Berlin”. After I listened to the story I got so excited that I immediately contacted Der Hauptstadtwinzer (vintner). Daniel Mayer is a trained winemaker and the person in charge of the grapes at this, Berlin’s oldest vineyard, with grapes planted to Pinot Noir and Riesling over 40 years ago. Daniel kindly invited me to the next working bee there. I eagerly waited for the day in anticipation. When I got there I couldn’t believe my eyes: vines in Berlin – who would have thought this ever possible?! 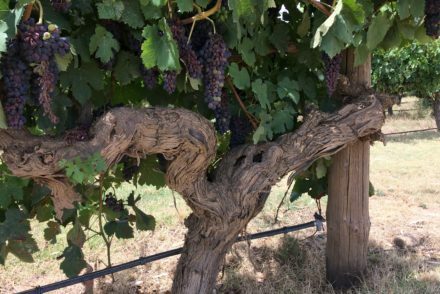 The vineyard’s history is fascinating. It was born out of a city partnership between Friedrichshain-Kreuzberg and Wiesbaden and Ingelheim, two towns from the state of Hessen, one of Germany’s major vine growing regions. The partnership was founded during the Cold War, when Berlin was isolated from the rest of Germany. This vineyard was planted in 1968 to symbolise that West Germany “had not forgotten Berlin”, with the vines representing ‘life’ and ‘joy’. The name Kreuz – Neroberger is another symbol, standing for the hill of Kreuzberg in Berlin, and Wiesbaden’s hill of Neroberg. Since Daniel’s first invitation I’ve been back to the vineyard many times to be part of a volunteer team that regularly helps him maintain the vineyard. We’ve done lots of pruning, fixed canes to trellis, positioned young shoots, replanted vines, repaired the trellis and recently started canopy management. It’s been a great experience: not only have I met some great people, I’ve learned a number of new skills that are complementing my Sommelier studies. And working in this vineyard is fun! Daniel keeps us motivated and amused at all times. Often we finish the day by sitting down together in ‘our little shed’ with a glass of wine, happily satisfied with this labour of love. “But when can we taste the wine made from the grapes in ‘our’ vineyard?” I once asked Daniel. “And where can I buy it?” “You can’t,” was his reply. Daniel explained that due to legal constraints and German wine laws this wine cannot be sold. 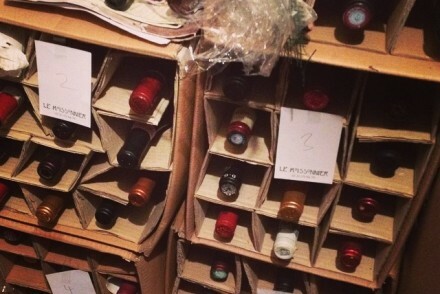 However it “might be possible” to obtain a bottle by donation when contacting ‘the owner’ of the vineyard – the owner being the local city council. Ergo, it’s not easy to get a bottle of this rare drop. My frustration was abated this week however, on receiving an invitation to attend NPR News Berlin’s May Salon, hosted by Svetlana Stepanova and Stefan Theil. Hurrah! It would feature a talk by Daniel about the vineyard and lo! A rare tasting of the coveted Kreuzberg wine! A small group of us gathered in a cosy room at the back of a beautiful bookstore in Friederichshain to listen to Daniel and learn more about the history of Berlin’s vineyards, which – to my surprise – I found out were first established over 800 years ago. It was all very interesting but I found it hard to focus: I could not wait to taste that Kreuzberger wine for the first time! Luckily our hosts managed to secure TWO bottles of different vintages, which made the tasting even more exciting. We opened a 2006 and a 2013 “Kreuz – Neroberger” Riesling. The later vintage excited Daniel in particular; he has been in charge of the vineyard since 2011 so this was a rare opportunity for him to critically assess both vintages, one of them produced under his care. The 2006 Riesling was opened first. Once poured, it presented with a beautiful dark golden colour. 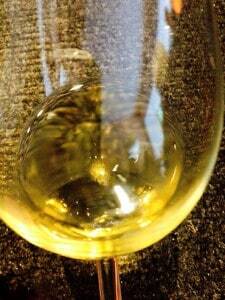 The wine was completely clear of sediment and immediately started to subdue me with its aromas. The first sniff offered beautiful aromas of wild honey and citrus. The wine smelled surprisingly clean for such an old drop but had also started to show some faint Sherry aromatics (ie the first sign of oxidisation). But it was not at all unpleasant. The acid was still firm but soft, and the wine finished with a pleasant long aftertaste. This 2006 “Kreuz – Neroberger” was a great surprise and a joy to drink. If you still have a bottle of this wine – or you’re lucky enough to obtain one from the local city council – don’t hesitate: open it now. Drink it on its own, or after dinner with by some mild soft cheese or dessert. The 2013 “Kreuz – Neroberger” Riesling was next. It’s colour was light gold, sparkling in the glass and showing off its brilliant reflexes. I didn’t even need to put my nose in the glass to get a good first impression. It jumped out of the glass, flexing its muscles and showing aromas of strong citrus and a beautiful floral scent. At first sip the wine exploded in my mouth and tasted extremely fresh. Offering up strong grapefruit and lime flavours (which delivered some very strong acidity), these flavours were accompanied by aromas of green apple and quince. 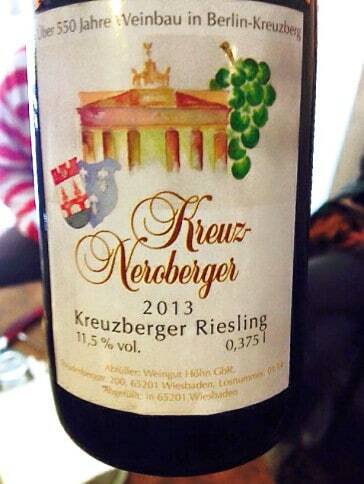 This 2013 “Kreuz – Neroberger” Riesling is a very powerful and well-structured wine. The powerful acid makes it a keeper and the wine would benefit from at least another two years of cellaring to become more complete. Nevertheless, summer is not far away and what wouldn’t be better for Berliners to enjoy than a great glass of Kreuzberger Riesling on our balconies or in picnicking in the park – that is if we could get hold of it! 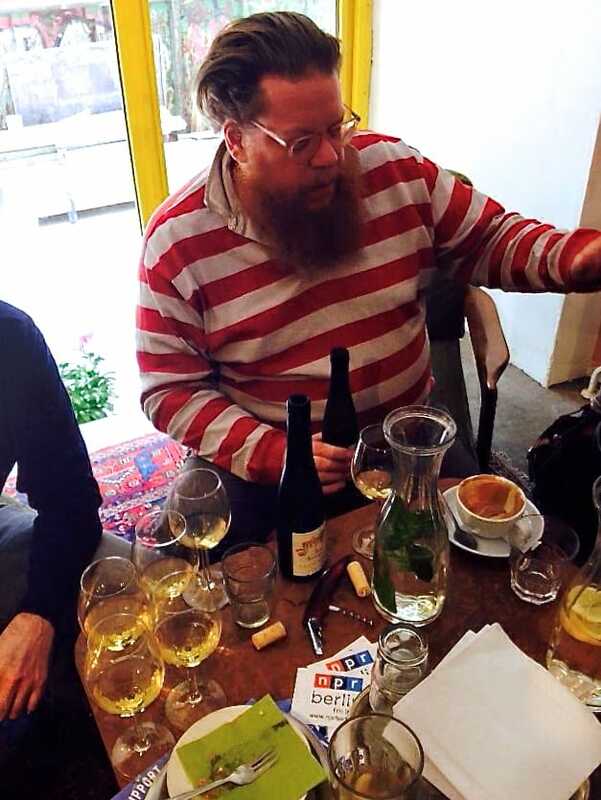 This tasting was a great success: many thanks to Daniel Mayer for sharing this fantastic Berlin wine story, and to the people from NPR Berlin for the invitation to this very enjoyable tasting. Megan Spencer made a beautiful photo essay on the vineyard, visit this link. Daniel is always looking for volunteers! For more information on Daniel Mayer and the vineyard, visit his website.